LEGRABOX has 3-dimensional height, side and tilt adjustment. 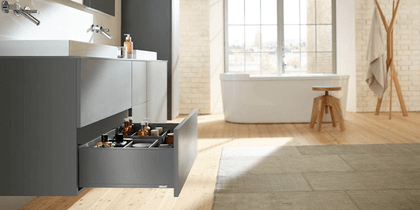 It ensures a precise gap layout both in drawers and in high fronted pull-outs. When installing, LEGRABOX pure comes with the following safety features: You just need to place the front in its holding position and it will easily clip into place. The front can be assembled even when the pull-out has been inserted. Removal is just as easy; the holding position allows very wide fronts to be removed by just one person without much effort.